On Saturday, April 17th, The Hawaiian Heritage and Environmental Sustainability Fair will be held in Paia, featuring sustainable companies and projects from all over the island. 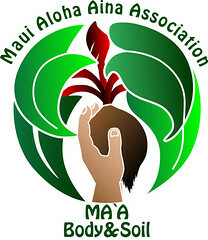 Again this year we are teaming with Vince Mina and the Maui Aloha Aina Association to host the kickoff event for the Body & Soil Conference. This year’s theme is “Getting to the Heart of Body & Soil Vitality”. We’ll have short presentations by each of the world-class presenters. You will be able to purchase tickets for the 3-day event (January 14-16) at the meeting. The opening is a FREE night of great information from world-renowned speakers so you really don’t want to miss it. Come early to talk story at 6:00 P.M. Presentations will start promptly at 6:30 P.M. Watch for the blue and yellow South Maui Sustainability signs starting at the Pi’ilani Highway and Ohukai St in North Kihei. Sign up to help with planting at the KES Garden! No gardening experience is needed. Our garden volunteers are always a big help to teachers and students, and it’s a lot of FUN for the volunteers too! New volunteers from the community are always encouraged to join us, so even if you can’t make this event, let us know you are interested and we’ll add you to our school garden mailing list! Sign up by selecting form below or call Kathy at 344-0469 or email kathy at southmauisustainability dot org to sign-up or get more information. You have your choice of several days and times. Click to sign up. Please make sure to submit the form. You will receive confirmation within 48 hours.